Data from Baldwin Locomotive Works Specification for Engines as digitized by the DeGolyer Library of Southern Methodist University Volume 10, p. 242. Works numbers were 5925, 5929 in November 1881; 5948, 5953 in December. These Ten-wheelers were small even by the early '80s' standards. One note on the specs states that the "Inside seams of furnace [sic] countersunk and all rivets driven nearly flush with sheet except those in water space." The grate had 2 1/4" water tubes. They all operated for over 30 years with 265 the first to be scrapped in December 1914, followed by 263 in October 1916, 264 in December 1917, and 266 in October 1920. Data from Angus Sinclair, Railway and Locomotive Engineering, Vol XV, No 8 (August 1902), p. 335-336. Sinclair pays particular attention to the fireman's position in this class of camelbacks. He explains that a lot of the discomfort and peril of coal-heaving in a double-cab came from requiring the fireman to work from the tender, or worse, straddle the footplate-tender junction just a couple of feet above the rails. In this engine the "coal digger" is placed "on deck" which offered the advantage that "...with all the motion of the engine, the fireman and firehole door maintain the same relative position to each other all the time." As a result, the man moved coal over a shorter distance and at a lower height and would have a truer aim at the door. Another amenity was that the fireman was housed in a complete cab that could be fitted with "curtains over the doors that would make [him] decidedly snug, and furthermore, he can't fall out." Sinclair claimed that "The engines are very popular on the road, they are well liked by the men, and are doing excellent work". Data from CNJ 7 - 1944 Locomotive Diagrams supplied in May 2005 by Allen Stanley from his extensive Rail Data Exchange. One of a series of Camelback Ten-wheelers built for the Central of New Jersey, the L-5b sextet (169-174) is featured in the photo section of Bruce's The Steam Locomotive in America (1952). And it's a worthy representative of the type with the center cab wrapped around the boiler and the massive Wootten firebox showing its polished steel over the third driver. 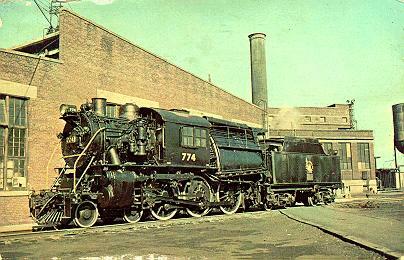 As Bruce depicted the locomotive in its original, saturated-steam state, his data showed a total EHS of 2,512 sq ft. Superheaters for this class -- which had several subclassess -- were installed in the late 1920s and early 1930s for the most part, although a couple were refitted in the early 1920s. Drury (1993) notes that the 111 Camelbacks "were essentially the same locomotive" and served as mixed-traffic engines into the 1950s. Data from DeGolyer, Volume 35, pp 119. (Thanks to Chris Hohl for his 20 April 2015 correcting the valve gear ID, tender fuel capacity and its loaded weight.) Works numbers were 35107, 35143 in August 1910; 35239-35244, 35280-35281 in September. Firebox heating surface included 19 sq ft (1.75 sq m) of combustion chamber. Cylinders received their steam through 13" (330 mm) piston valves. This class of double-cab passenger power spend much of its career on commuter service and thus were a commonly seen and photographed class. By the 1930s, adhesion weight on the unmodified engines was recorded as 164,600 lb (74,661 kg) and engine weight had grown to 217,200 lb (98,520 kg). Perhaps surprisingly, these ten locomotives were superheated much later. ; see Locobase 6726. Data from CNJ 7 - 1944 Locomotive Diagrams supplied in May 2005 by Allen Stanley from his extensive Rail Data Exchange. See also DeGolyer, Volume 42, pp. 314+. (Thanks to Chris Hohl for his 27 August 2015 email reporting the tender's capacity and estimated weight and for suggesting a review of heating surface areas that led to some revisions.) Works numbers were 38758-38762, 38865-38869 in November 1912. 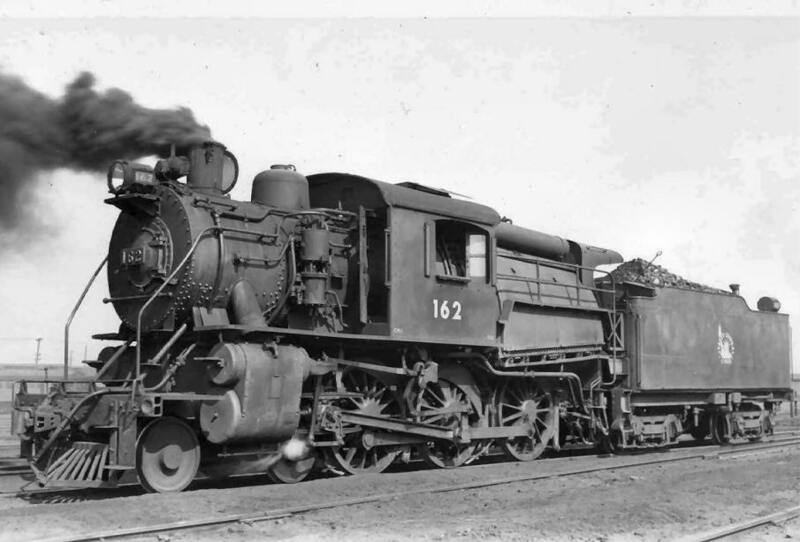 1912 saw Baldwin's delivery of the 760-769 as superheated locomotives. Their increased power almost immediately led to the CNJ's conversion of the L-6s (Locobase 13672) to the same design. Chris Hohl's email pointed out that the tender weight was originally estimated at 150,000 lb (68,039 kg) and that the Baldwin engines' boiler were set at 200 psi. Their adhesion weight was estimated at 160,000 lb (72,575 kg). When delivered, they had small combustion chambers contributing only 19 sq ft (1.77 sq m). The ten engines built in 1910 (Locbase 13672) were superheated to the same specifications much later than usual. In the process the L-6s sacrificed 176 small tubes, but gained cylinders with an inch greater diameter. The boilers in the rebuilds did not have combustion chambers and by the time most were modified, the 1912 L-7s had surrendered theirs as well. 755, 757, and 758 were made over in June, August, and July, 1928, respectively. 759 followed in February 1931. After a nine-year pause, the 756 received its upgrade in June 1940. Two more followed in 1941 (754 in April, 752 in November) and 750 followed suit in August 1943. With no reason to replace these quite-satisfactory engines, their retirements only came in 1953-1954 at the end of steam. Data from CNJ 7 - 1944 Locomotive Diagrams supplied in May 2005 by Allen Stanley from his extensive Rail Data Exchange. See also DeGolyer, Volume 49, pp. 327+. 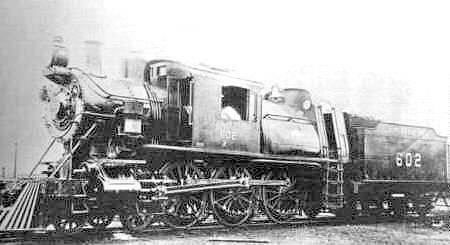 Works numbers were 41027-41028, 41041-41048 in December 1913. A later batch of Camelback Ten-wheelers of the same power dimensions as the L-6as and L-7s shown in Locobase 6726, but a grate that was widened a foot to 9 ft 1/4" (2.75 m). Interestingly, the enlargement of the grate resulted in only a very modest increase in firebox heating surface. The short combustion chamber added 18 sq ft (1.67 sq m) to the firebox heating surface area. Piston valve diameter measured 13" (330 mm). Like the earlier camelback Ten-wheelers on the CNJ, virtually all of these engines served to the end of steam on the railroad in the early-to-mid 1950s. Data from CNJ 7 - 1944 Locomotive Diagrams supplied in May 2005 by Allen Stanley from his extensive Rail Data Exchange, corrected by DeGolyer, Vol 59, pp. 98+. Works numbers were 47868, 47914, 47962 in February 1918; 48027, 48074, 48149 in March; 48280-48283 in April. And information from John McCoy Oct 10 1998, 12:00 am Newsgroups: misc.transport.rail.americas From: igop ...@ix.netcom.com (John McCoy) Date: 1998/10/10 (accessed 13 March 2005). Roster information from the Northeast Railroads website  (accessed 13 March 2005), which Locobase used to identify the class only generally referred to in McCoy's post. Given that only one 4-6-0 class reached 40,000 lb of tractive effort, it's likely that that group of eight engines is the subject of McCoy's data. This was confirmed by the 1944 book, which showed a classic Camelback Ten-wheeler that must have been among the last of the type to be built. Like most 20th century camelbacks, the L-8s had a very short combustion chamber that added only 18 sq ft (1.6 sq m) to the firebox heating surface. Piston valves measured 13" (330 mm) in diameter. This class was retired at the end of steam in 1950-1954.